End chronic pain—for good—with this practical guide from the PBS personality behind Classical Stretch and author of the New York Times bestseller Aging Backwards. Chronic pain is the most common cause of long-term disability in the United States. Twenty percent of American adults accept back spasms, throbbing joints, arthritis aches, and other physical pain as an inevitable consequence of aging, illness, or injury. But the human body is not meant to endure chronic pain. Miranda Esmonde-White has spent decades helping professional athletes, ballet dancers, and Olympians overcome potentially career-ending injuries and guiding MS patients and cancer survivors toward pain-free mobility. Now, in Forever Painless, she shows everyone how to heal their aching bodies and live pain free. The root of nearly all pain is movement—or lack thereof. We need to move our bodies to refresh, nourish, and revitalize our cells. Without physical activity, our cells become stagnant and decay, accelerating the aging process and causing pain. People who suffer chronic pain often become sedentary, afraid that movement and activity will make things worse, when just the opposite is true: movement is essential to healing. 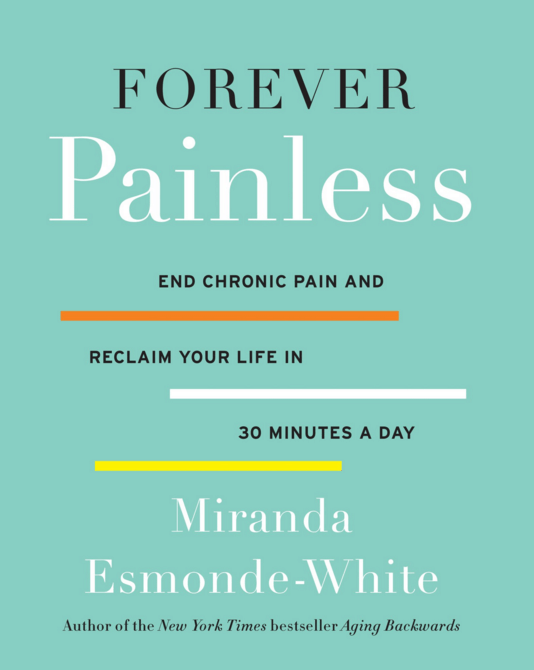 In Forever Painless, Miranda provides detailed instructions for gentle exercise designed to ease discomfort in the feet and ankles, knees, hips, back, and neck—allowing anyone to live happier, healthier, and pain-free no matter their age.